If you are not planning to send gifts to your referral sources this year, you might want to think again. Surveys show that it increases referrals when sending a Christmas gift or card. It’s important to remind people they are important to you by thinking about them during the holidays. It can help your business grow (not to mention your family/friend relationships as well). Disclaimer: Keep your gifts under $30. Many doctor’s will give away higher priced gifts to avoid even a semblance of a “fee for referral” violation. 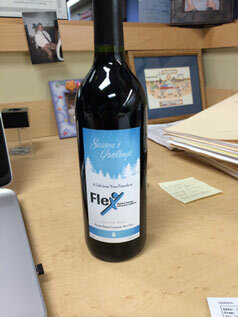 View a sample customized bottle from Flex Physical Therapy! Quick handouts that physicians can give to their patients suffering from pain/soreness/stiffness, that instructs them on self-care and basic movements/stretches, can go a long way to building relationships that last! If you don’t have such quick handouts, start making them. It’s a great activity during downtime for your staff. Get them professionally printed with your practice info on them and give to physicians. Physicians love being able to give their staff gifts (that are free to them)! 30-minute massage certificates are a great way to get their staff into your facility and subsequently talking about you. Make sure to specify that it’s for the doctor to give away to their staff. The physician themselves typically won’t redeem for themselves unless they too have a pain or soreness. TIP: At the very least, send a Christmas card. If it has a photo of you and your team even better! Helping your referral sources “put a face to the name” is known to increase referrals. See sample below. Having a Picture of Your Staff Leads to More Referrals! Good luck! And I wish you a Merry Christmas!